After one bite of this salad I had expletives shooting out of my mouth- so much so I immediately thought to myself, this is what Chris from Keepin' it Kind must feel like after he devours incredible vegan food (if you follow Kristy's Blog you will know that Chris tends to swear while eating super delish vegan food). 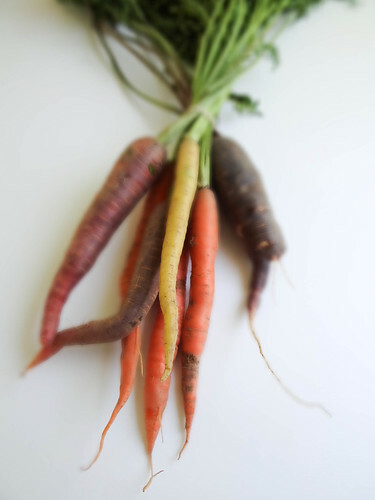 My inspiration, once again, came from a bundle of beautiful rainbow carrots from Sanborn Mills Farm. I am sure going to miss them once the farmer's market season comes to an end. They have a way with the vegetables they grow, always so breathtakingly beautiful - a beauty that draws you in. Yes, I am obsessed with beautiful food- call me crazy or call me full 'cause that's what I was after eating this salad. On Saturday's I look forward to my bike ride to the Market, most weekends I am joined by my Mom where we meet up at her house early in the day, sometimes my sister joins us, other times I ride alone. I have always loved the peacefulness of early mornings. This past Saturday we celebrated my sister's 28th Birthday with a BBQ at my Dad's house - the celebration included this salad, a double tiered four layer Peanut Butter & Jelly Cake along with a grand fireworks display, that was incidentally short lived. Justin has been waiting all summer to light off his big box of fireworks, we thought my sisters birthday weekend was the perfect time. We called up my fireworks enthusiastic Uncle who lives the next street over and set up the site for what we deemed to be the epic fireworks show of the year. We rallied off 3 large fireworks to kick off the show, just as Justin and Uncle Phil went to set up the next round of fireworks, a neighbor visiting family with her older children put a screeching halt to the show, citing the noise (at 9pm) was simply too loud for her children to sleep through; what a Party Pooper. Needless to say, Justin still has a box of fireworks that he is determined to send off before the end of summer, which I might add is approaching all to quickly for my liking. Soon enough, we will be packing up the sunscreen, flip flops & bathing suites for comfy sweaters, tall boots & hot chocolate. Typically I cannot wait for the return of Fall, this year, however I am sad to see summer coming to an end so soon. 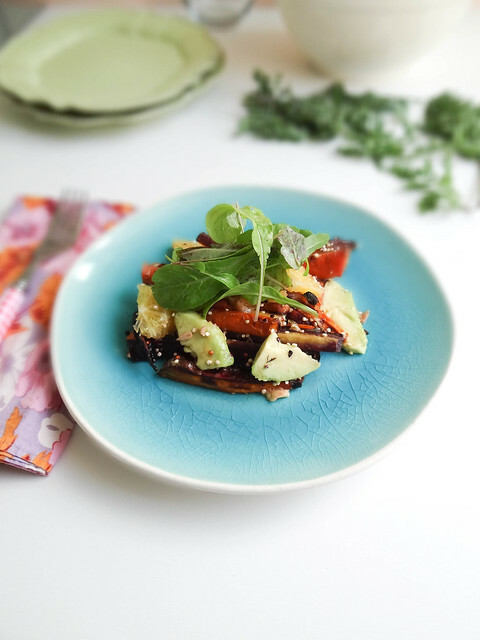 This salad is a great transition from summer to fall - a fusion of the two seasons. 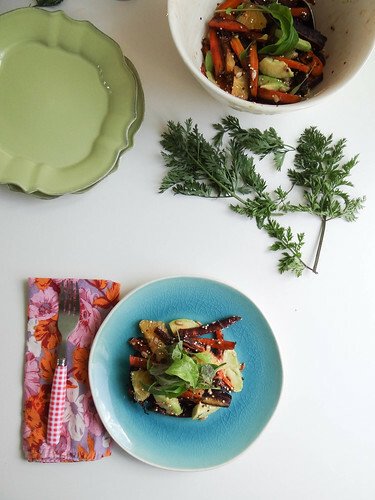 Roasted carrots paired with bright citrus and avocado with greens that excel in the oncoming cooler months. 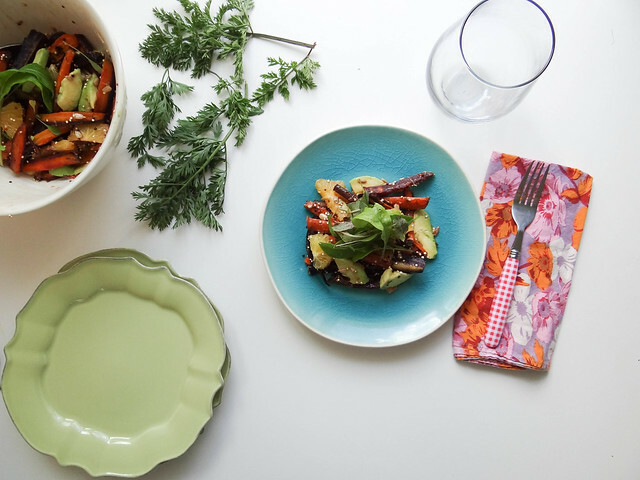 At least I have this salad to make the transition from Summer to Fall a bit easier..
Just a quick note, the salad is tasty anyway your serve it, but is totally swear worthy when served first made. The flavors simply pop when the roasted carrots are tossed with the orange balsamic olive oil straight out of the oven. 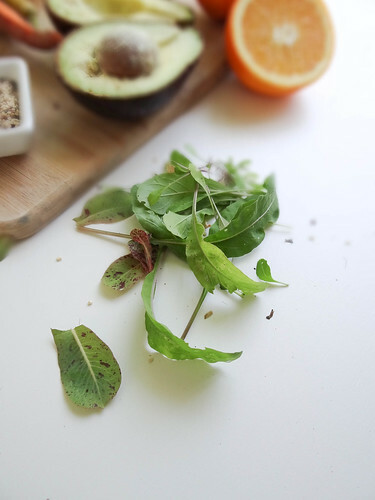 If made or saved for the next day, the acid from the oranges keeps the avocado a vibrant green - the salad is very good at room temp or straight out of the fridge if you are feeling lazy. 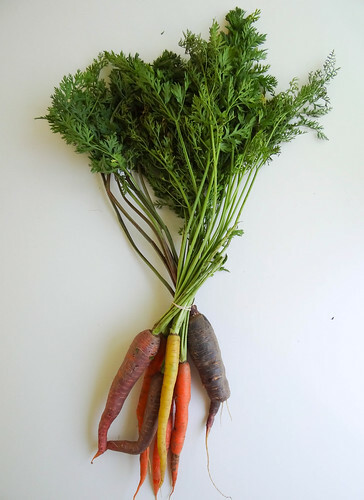 Scrub & prep carrots, slice carrots into thick match sticks about 3-4" in length & 1/2" or so in diameter. 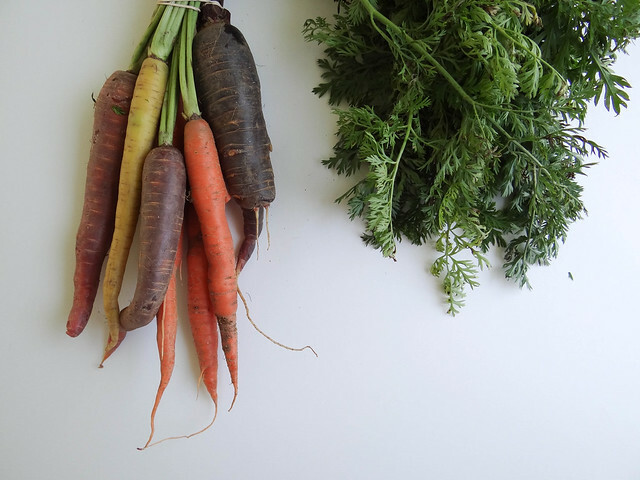 Place carrots on a rimmed baking sheet and liberally spray carrots with olive or coconut oil- toss to coat. Roast carrots in pre heated oven for 20 minutes or until nicely roasted. 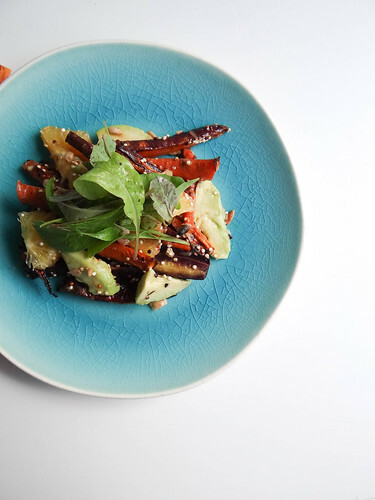 While carrots are roasting, prep your orange and avocado- set aside. In a medium serving bowl, add juice of an orange, 2 tbsp of olive oil and a splash of balsamic- whisk well. Once carrots are done roasting, remove from oven - allow to cool for 1 minute then add to mixing bowl. 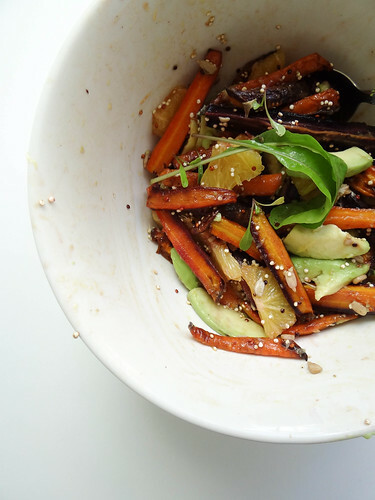 Toss carrots with the vinaigrette. Add sunflower seeds & quinoa- tossing well. 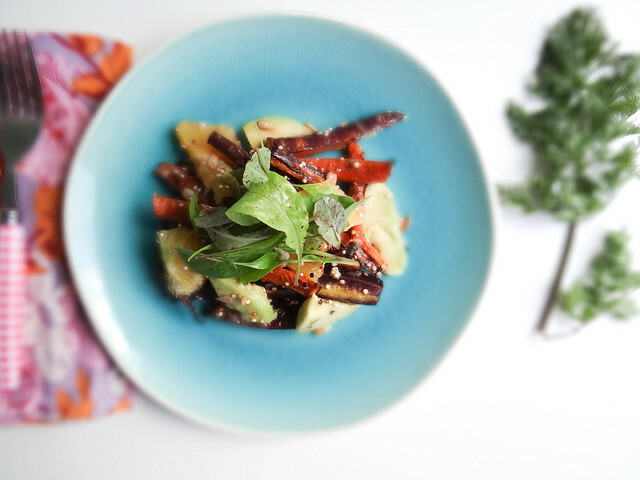 Add to the bowl the avocado & orange slices- gently toss with carrots until all ingredients are well combine. Season with good salt to your liking. 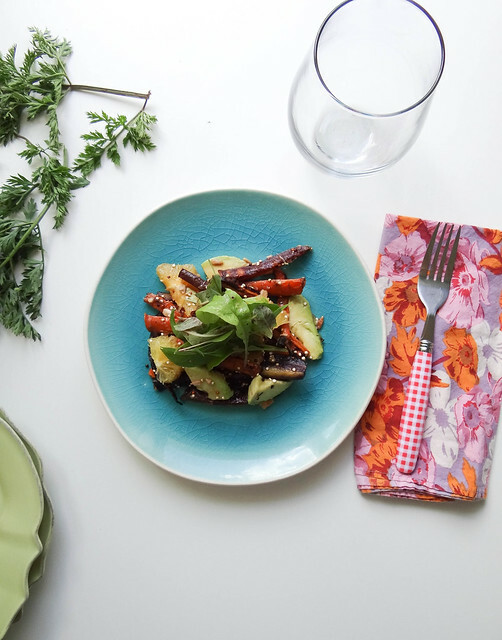 If plating individually top each serving with the micro greens, if serving to a large group from the serving bowl simply top with a healthy handful of micro or young greens. This salad is so pretty! Love the colours! Thanks Katrina! I love the colors here too, there is just something about brightly colored produce that captures my heart! this is so pretty! 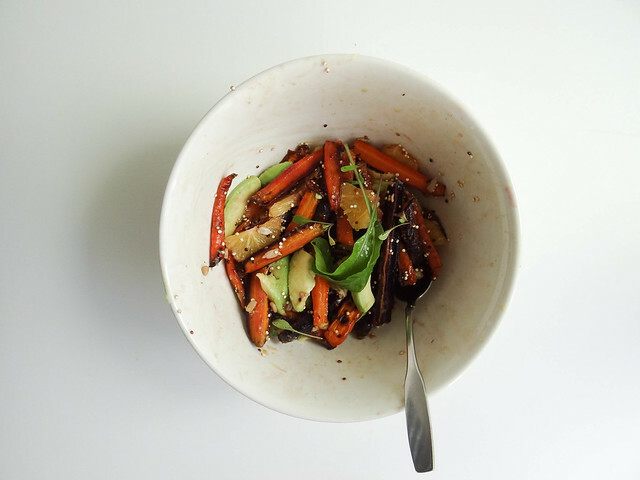 i love that you used different colored carrots AND tri-colored quinoa! so colorful! Thanks Chris, sesame seeds would be great too! This salad looks and sounds delicious! I loooooooove roasted carrots. Thanks so much for sharing! 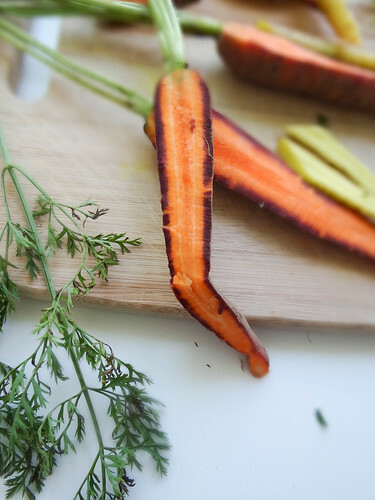 Aren't roasted carrots the best, they are one of my faves too! Those roasted carrots are beautiful! And with avocado too? I'm sold! 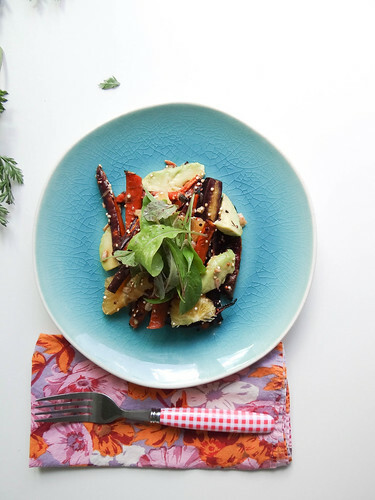 The avocado is definitely one of the best things about this salad- avocado makes everything better don't you think? Sounds like there are a lot of us out there! I just discovered the combination of orange and avocado, and I love it! I rarely roast carrots though, probably because I tend to see them as just a side dish, so I like that you added the quinoa to bulk it up. And I agree - Fall is approaching too quickly for my liking! Isn't the combination super good! Today definitely feels like fall, I can't believe that it is Labor day weekend!